Improve your circulation and strengthen the immune system, being healthy has never been so enjoyable! Whether you like it warm, hot or sweltering we have it for all tastes. The infrared cabin heats the body with a pleasant warmth and has beneficial effects on bones, muscles and joints. The steam bath with a temperature of 60 degrees and a higher humidity of 90 percent, acts as a skin and respiratory conditioner. For those who love the even higher temperatures, there is the Edelweiss sauna, which with its 90 degree heat strengthens the circulation, promotes perspiration and leaves you feeling reborn. 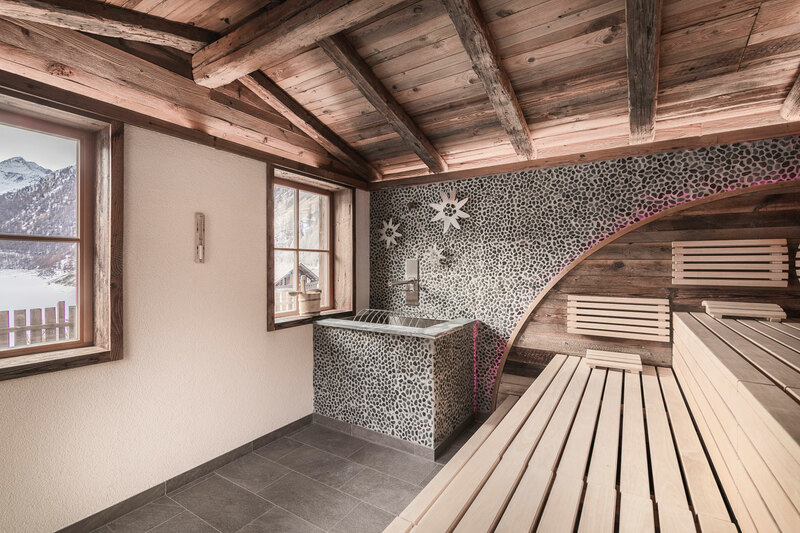 At the heart of our village is a very special building: the chalet that houses our alpine style wellbeing zone. The highlight of our exclusive spa is the sauna, ideal for relaxing the muscles after a long hike in the mountains or warming fatigued limbs at the end of a ski day. The vast view from the sauna visible through the large panoramic windows ensures that while your skin is tingling with pleasure, your eyes will be feasting on the beauty of your surroundings. Let yourself go, experience the heat of the sauna with its regenerating powers.